I wanted to share how I use a scanner to scan directly into Evernote using a Mac. 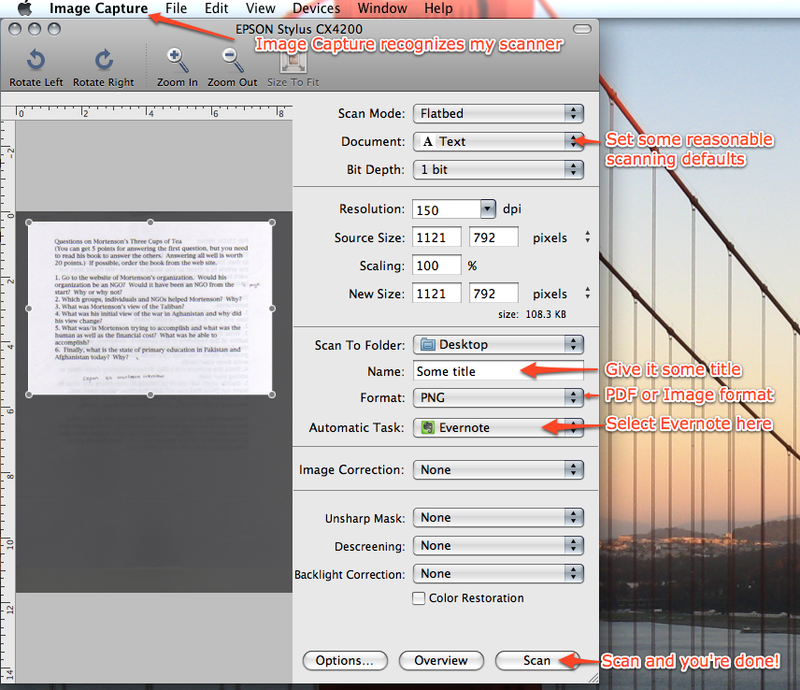 To scan I used a program called 'Image Capture' that comes standard with OS X (/Applications/Image Capture). This app automatically detected my scanner as a capture device (it supports most common scanners and cameras). In essence all you have to is set Evernote as the 'Automatic Task' as well as some reasonable defaults for the quality of the scan (as you can see on the screenshot). Some notes: using 1-bit PNG files makes the files very small, but the quality is not really good. I would probably suggest to experiment with some different settings to see what quality suits your purposes. Another point worth mentioning is that if you use PDF as a format – Еvernote doesn't currently make them searchable. To leverage the image-recognition use JPEG or PNG. Hope this helps someone. I currently use this setup myself and it is working pretty well. In the near future I also plan to make some Automator/AppleScript actions to automate this even further. I've been wanting this for ages! Thanks for sharing. I just picked up a NeatReceipt scanner and am trying to use it per your instructions with Image Capture, but the file that is output has an extension of .iff no matter what format I choose for the scan, jpg or png. Since it is this strange extension it does not import into Evernote. Any ideas? Is that suffix ".iff" or is it ".tif" or ".tiff" ? it is .iff, which I know makes no sense. I was hoping I could speed up the process of scanning documents into Evernote and get a smaller file size than the PDF's I get from NeatReceipts, but I will lower the size setting in NeatReceipts and see how it goes. i have an HP 6200 scanner. any idea how to get image capture to recognize that? i have a more more basic problem i guess! I really like that feature, but my scanner is not supported (HP Officejet 6200 series). It is connected via USB, and this will not work over an Airport (no scanning will). Obviously you will have to adjust it to your folder system, etc. However, this is a great template (at least in my opinion). Also, remember if, in Automator, you go to File>Save As, you can choose to save it as an application. That way, you can simply put the document in the scanner and double click the app. Very nice. This works in conjunction with the other post about making an auto-import folder as well. Check out the previous admin post about that. Thanks! The auto folder script does not seem to work for me. Posted a message in the other thread. This automator script I have not tried yet. Will try and report back. I realize that my original script isn't "complete." It doesn't be sure that everything auto-imports (I am fixing this assuming you already have the auto-import folder working). I am also working on the timing (as you can't apparently just wait until the scanner is done...gotta assume a time), as well as how to get around the possibility of whether or not you have the Adjustments window already open. I will post a download link once I have this one ready. Until then, just hold tight! HERE is the updated version of the workflow. Also, be sure that you have folder actions enabled. You have to re-enable them each time you login (I know, I know). I am working on getting Automator to do this. Simply right-click the "Evernote Auto-Import" folder and click Configure Folder Actions. Then close the window that pops up. They are re-enabled. As for the v2 workflow, it still needs some tuning. I hope to remove some of the pauses (to save some time), as well as a few other changes (I'll see when I get there). But for tonight, I really should have been doing my homework, so I will be back tomorrow. You know what? You should run the Permissions Repair. Applications>Utilities>Disk Utility. On the left, click your Macintosh HD (or whatever you may call it), and then click Repair Permissions. Depending how long it's been since you last did this, it may take a little while. i guess i will revisit this later. Does Evernote normally support .doc files? I really don't know. As for the date created, I am going to take a look at the Applescript and see if I can fix that. I agree that it should be when you added the note, not when the file was created. Perhaps we could make a second version. I also found a solution to why I had to re-enable the Folder actions with every login. I posted in the other thread. Awesome. Now I don't have to go wandering about the Applescript. If you have the 500-series ScanSnap which includes OCR in the PDF, then PDF is a great solution. Otherwise, you may want to consider JPEG, since that will be processed by our recognition system. I'm confused by you comment on PDF's and the scansnap. If I look at a typical web page or at a .pdf document and say print -- print to pdf -- save pdf to evernote, it seems that my document (which I assume is a .pdf) is immediately searchable by evernote (mac client). 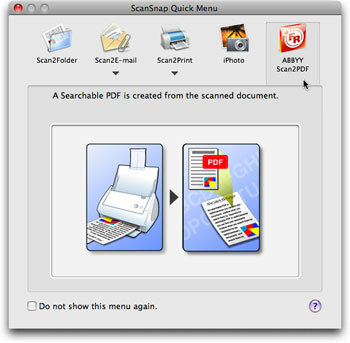 However if I scan a document using the scansnap s300m (no OCR capabilities) the document is not searchable. Supposedly both are .pdfs, so why can I search one but not the other - given that as far as I can tell neither one has run through OCR? If you take a text document (like a web page) and then save it to a PDF file, the PDF will contain the text content of the original document. This means you can highlight part of the text, copy it, paste it somewhere else, etc. If you make a PDF file from a digital scanner, you are capturing a picture of the document. If you open this in a PDF viewer like Preview, you'll see that you can't select the text you see ... this is a picture of text rather than text. In the first case, Evernote can search for words within your PDF because the PDF contains those words. In the second, there's just a picture, and Evernote does not find the words within a picture stored in a PDF. If, on the other hand, you were to scan to a JPEG file and put that into Evernote, it would be synchronized to the server, processed there, and then we'd give search results back to your client so that you could search for the JPEG image. The 500 series ScanSnap does OCR on the PDFs it produces, which means they contain both the original image of the page, plus a text extraction of that scan. I use ReadIris to OCR text from the documents I scan using ScanSnap Manager, which came with my Fujitsu ScanSnap S500M batch scanner. I have ScanSnap Manager set to pass scans to ReadIris, and ReadIris is set to pass it's PDFs with embedded text (from the OCR) to Evernote. It's an extremely slick setup. The PDFs come out far better than normal scanned jpgs in evernote, because you can select the text in the document. At this point, Evernote's OCR abilities are only used when I need to take a picture of something with my iPhone and want it in Evernote. My next step is to implement this article's applescripts http://www.macworld.com/article/137091/paperlessoffice.html to make the process faster. Also, on that note, my S500M did NOT come with the OCR software you are all talking about. I was told when I emailed Fujitsu that it was only bundled with the later models in the series (The S510M, I believe). I would love to get the software, but neither the OCR company nor Fujitsu will send it to me. So, buy another scanner, basically. Abbyy has never released their scanning suite for OS X (which at least on PC is one of the best by far) other than in this bundle. edit- Found it! Abbyy has it available now on their downloads site. I'm now using the drop folder method with the finereader OCR. I'm still running into some issues. Finereader doesn't have a "pass to another program" option. All it can do is either save to the place the original PDF came from with "processed by FineReader" added to the end of the name, or it can open a save dialog. So the closest it seems I can come is have ScanSnap save to one folder (pictures), and then each time use the save dialog to move to the Evernote auto-add folder. Still simpler than what I was doing with ReadIris, but not great. I have no idea how to do applescript and all of that, but could I have it only import files with "processed by FineReader.pdf" at the end of the filename? Then I could just have ScanSnap save to the same folder, it would get passed to Finereader, which would auto-resave with that at the end, and the folder action would bring it into Evernote. I have a new version of the HP Auto-Import app. While there are no major changes within the app itself, it now does have a README. Which I think is important. hey, I finally tried this after not getting it at first. I had to quit the epson v500 utility and then tell it to set up twain. Finally worked. Yay! Really cuts down on the time. Expected expression, property or key form, etc. but found unknown token. I'd love to get this working because the only scanner I have at work is on the network and only emails documents to me. If I could have those attachments dumped into a folder and automatically picked up by Evernote, that would be amazing. You don't need any solution. If the scanner emails you the scans, then (assuming you use Outlook) simply create a rule that forward any message from the scanner to your evernote inbox email account. That is, unless you want to keep your scans in a local notebook. Is this still a valid point since Evernote Premium now offers PDF image/character recognition? I understand it does not convert the PDF to text like traditional OCR but does make most PDFs searchable. If you have a Premium account, then you can scan into Evernote without doing your own OCR, and we'll process them on the server. You may find it more convenient to do the OCR on your own computer, however ... the PDF you produce will be immediately searchable without waiting for us to process the document and sync, and you can immediately select text for copying out of your OCR. For someone with a Free account, then OCR on your own computer is the only option. engberg - since you mention doing OCR on your own computer, i am hoping you may know a quick way to do this besides Acrobat and similar slow/expensive tools. i find that most OCR applications take ages to load and then OCR and the process entails too much user effort and overhead. does anyone know any scac-to-OCR purpose built tools that work quickly or is it always going to be an intensive process? Unfortunately, I haven't found any decent PC/Mac OCR software for under $100. So if you're buying a new scanner, you can make sure to buy one with a bundled OCR package. Otherwise, if you already own a scanner without OCR support, then a $45/year Evernote subscription for PDF OCR becomes a possible option. I picked a Fujitsu ScanSnap scanner and it does most of the things I have read about on this thread. You can easier setup a profile to scan straight into Evernote as either PDF or jpg images. It is amazingly fast. It scans duplex (both sides in one pass) and does a great job. The model I bought (S300M) is portable and can be powered from the USB bus. I love this solution. It wasn't the cheapest scanner out there, but is has saved me hours with its speed. i have the S500 (Mac edition) but it comes with Acrobat that you need if you want to OCR. Are you OCRing your PDFs before sending to evernote? I am using an S1500M with only ScanSnap Manager for OCR processing before the PDF is sent to Evernote. If the S500 comes with ScanSnap Manager, give it a try without Acrobat. I couldn't get a straight answer out of Fujitsu as to why Acrobat was included with the scanner if ScanSnap Manager does the job. I find Acrobat to be overkill for simply scanning and creating PDFs. I find Acrobat to be overkill for simply scanning and creating PDFs. I agree that acrobat is overkill but I think the built in OCR could be specific to the 1500. I will find out more. thanks. I have found the Evernote ignores the rotation settings in JPG files - if I have my scanner software rotate a landscape-oriented page, it simply modifies the rotation setting bit in the JPEG header, but this apparently isn't used by Evernote. Evernote displays these images in a non-rotated format, while almost every other JPEG tool gets it right. To get around this, use PGN format for your scans. Evernote displays the content of your note using a modified version of the WebKit engine that's found in Safari, so it will display images in roughly the same way as Safari. If you open a JPEG in Safari, you'll see the same behavior ... Apple didn't choose to implement support for the relatively new JPEG "rotation" extension, and this (unfortunately) translates into Evernote. We do have a bug filed to try to work around this limitation of the OS, however. Has anyone found a simple way to join PDF pages? I have a regular flatbed scanner I'm using to scan documents, but having to manually join the pages together in Preview is driving me insane! Also, you can scan directly from imagecapture into evernote by simply selecting "Other…" in the "Scan To:" dropdown menu and choosing Evernote from you applications folder. Then when you scan a document it is automatically sent to Evernote. I dont have any easy answer but don't think I heard that Preview could 'join' two PDFs into one PAGE. i know you can combine multiple PDF pages into one document but one page is new to me. do share how you do that. I have a ScanSnap 1300m and using the Mac client, I am trying to scan and place a daily handwritten sheet of my notes into Evernote. I tried making the sheet a PDF and then a JPG and neither one is working well when I search for a word or number in the notes. Is the problem that Evernote cannot handle the hand written notes or am I using the wrong format? Plus, did you sync up, give the EN servers time to OCR your images & then sync down? Thank you, seems jpg images are the best method. It's been in my premium account for over a week now and simple number matching was not recognized, so I do not think EN is a solution for keeping hand written notes right now. Might just keep them in PDF format and see what happens in the future. Oh, IFF does not make sense, young padavan? It is an ancient file format used on the Commodore Amiga platform. I certainly do not know if this file really is an IFF - you could find out with any decent image viewer program. My best guess would be to rename it to TIFF and see what happens. I have used Yep  to scan multipage documents on my flatbed using the sheet feeder. The only downside to this is that by not doing duplex scanning, my pages get out of order and I have to edit the document in Preview to rearrange them. I'm hoping to get a duplexing scanner in the somewhat near future. OMFG. Thank you - I'd totally forgotten about Image Capture, and have been using the bundled app that came with my Epson Artisan 810 AIO. Awful software and a huge pain to scan, drop in Evernote, etc. This works like a charm - immediately found the scanner on the network and feeds right into Evernote. Automator includes a "Combine PDF Pages" action. I haven't tried it yet, so am not clear how it would be best set up. How exactly do I set Evernote as an 'Automatic Task'? I remember there used to be a dropdown box that was set to open Preview after each scan. I don't see that box anymore. I think what you're actually looking for is "Scan To:" - that's how it's captioned in my version of Image Capture, which is the most recent. When you open Image Capture, there should be some buttons at the bottom of the screen - in my case it asks for "mode" and "scan to." Select the scan to button and you'll get a list of folders and built in applications (such as iPhoto, etc.). Select "Other..." and navigate to your copy of Evernote, which is probably in the Applications folder. Select Evernote and you're done. There is a similar dialog on the right hand side of the window, which is only revealed when you select "show details." This adds several options - just go for "scan to" and proceed as above. I just got a HP OfficeJet 6500A Plus from Costco, and it's accessible through my wi-fi. Neat! Went to Image Capture and there it is as a shared scanner. Set the default application to Evernote (of course), and feed in the docs. Use the Scan button and each page is individually scanned directly into the Evernote program. Beautiful! Except, when I then take the 5 pages of a single document that were registered individually and merge them, the first page is merged last and vice-versa. The document is paginated backwards. Any idea how, in Evernote, to change the order in which merged pages are merged? Are you merging these pages within Evernote (via our "Merge" menu option), or is this something in your scanner software? You can merge separate pdf files into one document containing several pdf files using Preview ( in my case version 4.2 on Leopard 10.5.8 ). Open each page in preview by double-clicking the files. They open as separate 1 page documents. Open the sidebar beside each page - if this is not already open - to show a thumbnail of each page. As you drag page 2 from its sidebar into the sidebar of page 1, note the red vertical line. This indicates you can now release page 2 so it can be appended to page 1. You can drag the pages around in the sidebar to change the sequence. Save the new 2 page pdf document. Wow. I didn't know you could do this Preview. That will save me the more arduous method of using Acrobat. Thank you! wow. a 2008 thread. preview is actually pretty handy. and, there are now several free pdf programs out there that might do this (skim?). Yessir, just doin' my job... bumping threads on a Saturday afternoon.